"Please wait. This may take a few moments." 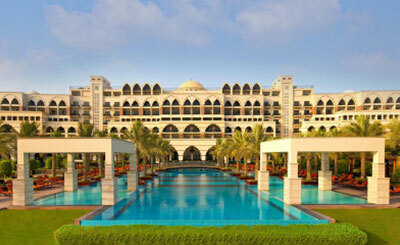 This luxurious 5 star beach property is located on the west crescent of the famous Palm Jumeirah. The hotel offers comfortable rooms and a host of facilities that make your stay all the more rewarding. Offering stunning views of the Arabian Sea, the hotel is strategically located nearby all the major attractions of the city. Right from shopping to theme parks and traditional souks, world class golf courses to avenues displaying stunning Emirati architecture. Merely 35 minutes away from the Dubai International Airport, the Jumeirah Zabeel Saray is one of the best places to stay in the vicinity. Lalezar : It offers Turkish wines from the hills of Antalya or traditional Samovar brewed tea and Turkish coffee. 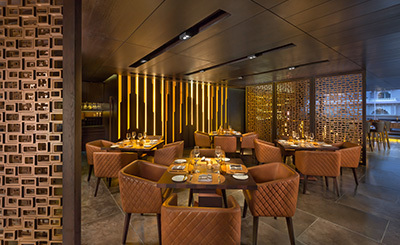 Classical Turkish cuisine is captured in an ambience which recreates the spirit. 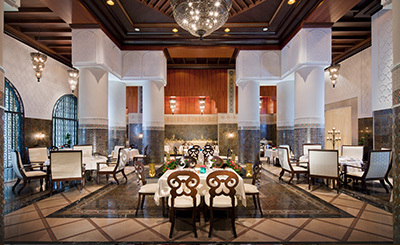 Al Nafoorah : It features an authentic selection of Lebanese cuisine. Enjoy a wide offering of mezzeh, main courses and desserts in surroundings which echo traditional Arabic and Lebanese character. 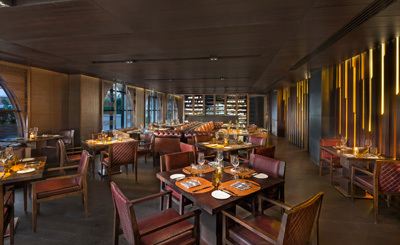 Amala : Located in the right wing of the lobby, This vibrant restaurant focuses on Mughlai curries, specialities from the Tandoori oven and Biriyanies - presented with a contemporary twist. Imperium : Start your day in style. Imperium, the hotel’s all day dining restaurant, features elegant crystal chandeliers, gilded columns and a terrace offering superb views of the sea. 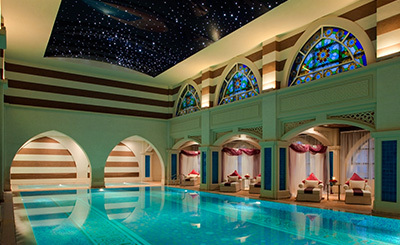 Ixir : Located on the ground level and connected to Talise Ottoman Spa, Ixir is the perfect venue to gather before or after a soothing hammam and spa experience. Plaj : Situated on the palm-fringed beach, this family friendly venue offers magnificent views of the sea. The perfect place for a light lunch with family & friends, this is the ultimate casual venue. 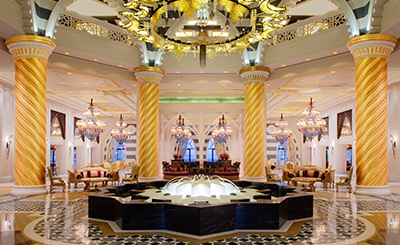 Sultan's Lounge : Take in the grandeur of the hotel lobby while you enjoy a connoisseur’s selection of teas and coffees. Voda Bar :This sophisticated bar and ultra lounge is the ultimate venue for the stylish to mingle. The exquisite sophistication is also reflected in the fine choice of cocktails. MusicHall : Experience a modern take on the traditional dinner dance – over ten international live acts each evening with extensive beverage and dining options. Ages 21 years and above only. 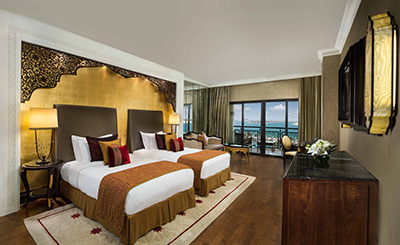 Deluxe Double Sea View Room - 56 sqm - 2 Queen beds - views over Arabian Gulf. Complimentary high speed internet access. Turkish themed interiors, private balcony. Walk-in rain shower, oversize Turkish marble bath tub and luxurious bathroom amenities. Parquet flooring. Complimentary access to Wild Wadi Waterpark and Sindbads Kids Club. Superior King Room - 46 sqm - 1 King bed - partial sea view - located on 1st floor. Complimentary high speed internet access. Turkish themed interiors, private balcony. Walk-in rain shower, oversize Turkish marble bath tub and luxurious bathroom amenities. Parquet flooring. Complimentary access to Wild Wadi Waterpark and Sindbads Kids Club. Superior Double Room - 56 sqm - 2 Queen beds - partial sea view - located on 1st floor. Complimentary high speed internet access. Turkish themed interiors, private balcony. Walk-in rain shower, oversize Turkish marble bath tub and luxurious bathroom amenities. Parquet flooring. Complimentary access to Wild Wadi Waterpark and Sindbads Kids Club. Club King Sea View Room - 46 sqm - 1 King bed - views over Arabian Gulf. Complimentary high speed internet access and daily buffet breakfast. Access to Club Lounge offering complimentary beverages and snacks included. Complimentary return airport transfer to/from Dubai International airport. Turkish themed interiors, private balcony. Walk-in rain shower, oversize Turkish marble bath tub and luxurious bathroom amenities. Parquet flooring. Complimentary access to Wild Wadi Waterpark and Sindbads Kids Club. Club Double Sea View Room - 56 sqm - 2 Queen beds - views over Arabian Gulf. Complimentary high speed internet access and daily buffet breakfast. Access to Club Lounge offering complimentary beverages and snacks included. Complimentary return airport transfer to/from Dubai International airport. Turkish themed interiors, private balcony. Walk-in rain shower, oversize Turkish marble bath tub and luxurious bathroom amenities. Parquet flooring. Complimentary access to Wild Wadi Waterpark and Sindbads Kids Club. 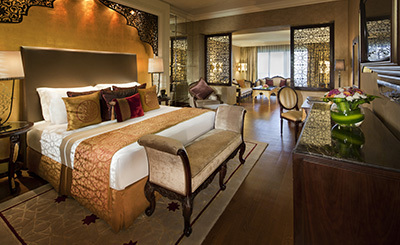 Deluxe King Sea View Room - 46 sqm - 1 King bed - views over Arabian Gulf. Complimentary high speed internet access. Turkish themed interiors, private balcony. Walk-in rain shower, oversize Turkish marble bath tub and luxurious bathroom amenities. Parquet flooring. Complimentary access to Wild Wadi Waterpark and Sindbads Kids Club. Beautiful Ottoman-inspired interiors flow out onto a private balcony with your choice of views across the Arabian Gulf or the Palm Jumeirah. The sleeping chamber with a king sized bed is complemented by an equally pristine marble bathroom with a separate rain shower and unique amenities by Lorenzo Villoresi. A complimentary fruit basket welcomes you when you step inside. The 94 square metres Imperial One Bedroom Suite offers spacious relaxation. You will be inspired by en-suite marble bathroom, and its unique Lorenzo Villoresi amenities where you can also enjoy exclusive access to the Club Lounge. Located on the Imperial Level, the highest floor of the resort, it overlooks the deeply satisfying views of lush green palm trees, white sandy beaches and azure waters. Your suite features a King sized master bedroom, individual living and dining rooms, as well as a guest bathroom. Sink into the wonder of the Two-Bedroom Suite that spreads across 142 square metres. While your suite features the en-suite bathroom, it also includes the spacious Master and Twin rooms with individual en-suite bathrooms, as well as a separate living and dining room. The spacious suite features a separate guest bathroom along with two private balconies overlooking the allure sea views. Enjoy the Lorenzo Villoresi amenities and exclusive Club Lounge access. Welcome to a world of wonder where your comfort and privacy are our priorities. The Imperial Two-bedroom Suite, located on the topmost floor of the resort, invites you on a unique journey of discovery. Space should be the last thing on your mind, which is why the suite is spread across 142 square metres with ample room for bedrooms, living areas, walk-in closets and three private balconies with unmatched sea views. From the Ottoman-inspired interiors to the marble bathrooms and the final touches of Lorenzo Villoresi amenities, every detail has been taken care of. Additional privileges come your way in the form of exclusive Club Lounge access, a king sized bedroom, a double bedroom – both with individual en-suite bathrooms, three private balconies, and separate living and dining areas with guest facilities. Join an elite circle of royalty and celebrities, who have been privileged to experience the wonder that is the Grand Imperial Suite. Rising above all else, the suite is located on the Imperial floor, occupying a prime position on the highest level of the resort. Spread across an expansive 310 square metres the suite has been envisioned to satisfy the requirements of the most discerning guests. 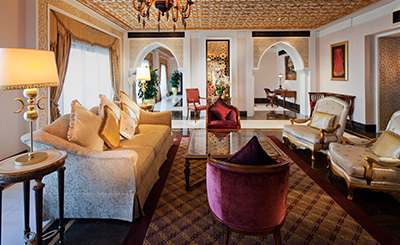 Service excellence is our mantra and with a private butler, the Grand Imperial Suite never falls short of perfection. Generously spacious living quarters, richly appointed interiors and unparalleled sea views from the vantage point of the grand terrace form the foundation of the excellence that awaits you. Your suite features a spacious king-sized master bedroom with our unique Marble spa and private sauna, grand terrace, a walk-in closet, private kitchen and butler service, as well as separate living and dining rooms. Many of the flights and flight-inclusive holidays on this website are financially protected by the ATOL scheme. But ATOL protection does not apply to all holiday and travel services listed on this website. Please ask us to confirm what protection may apply to your booking. If you do not receive an ATOL Certificate then the booking will not be ATOL protected. Book with Confidence We are a Member of ABTA which means you have the benefit of ABTA's assistance and Code of Conduct. We provide financial protection for your money when you buy a package holiday.If you buy other travel arrangements such as accommodation only this protection doesn't apply. Want more choices? Give us a call! If you can't find what you are looking for please call our experts who will find the right deal for you at the best price. Not all flight and holiday deals we have are available on our website. So if you call us now, you have a good chance of finding exactly what you want; be it regional departures, different travel dates or flight times, a specific airline or hotel etc. For a free & immediate callback, enter your number below and we will call you within 5 Seconds. X Would you like a free callback in 5 Seconds.